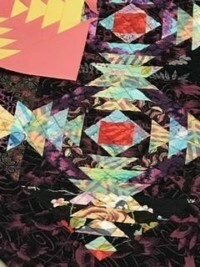 Thanks to everyone for registering your quilt for the show this year. We are hoping our 40th Anniversary Show is one of our best! 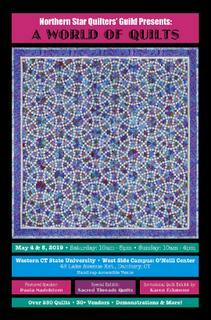 Remember to tell all of your friends about the show; use our postcard – email everyone you know! We look for everyone to do at least 2 hours of volunteer service for the show. 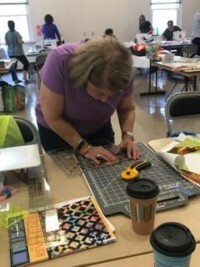 We need all hands on deck to ensure this year’s show is a success. 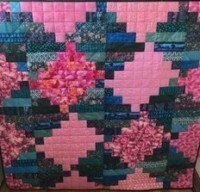 Held both Saturday and Sunday: Featuring new wall & lap quilts as well as FAT QUARTER Baskets each day! 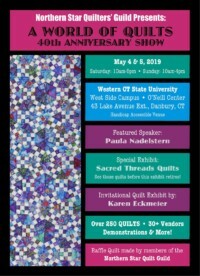 We are super excited to once again have the FIBER ARTS NORTHEAST exhibit at our show. 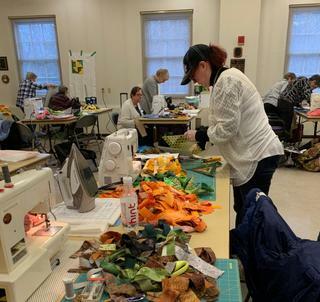 We have a beautiful Quilt up for Raffle this year, blocks made by members of the Guild, and quilted by Mary Cannizzaro…be sure to get your raffle tickets sold and turned in before the Show! 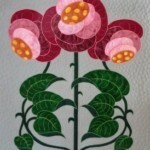 30 vendors with a variety of goods including fabrics, threads, notions , wools & more! We are also finalizing a couple more goodies, so stay tuned for further updates! 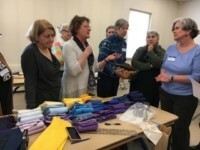 For those of you who registered your quilt for our show, remember that Quilt Drop-off is scheduled at KENNEDY HIGH SCHOOL for Saturday, April 27 from 1pm – 4pm. 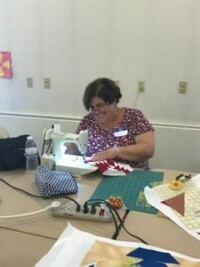 Make sure your quilt is clean, free of odors and lint; has a 4” sleeve attached to the back top of the quilt & that your registration number is attached to the lower right back corner of the quilt. All registration labels will be sent out to all participants in the first 2 weeks of April. 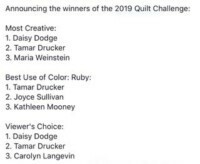 Congratulations to all who participated in the Ruby Challenge. 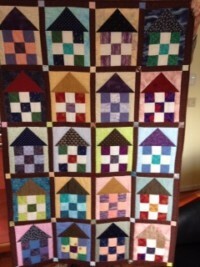 What a wonderful display of talent and imaginative use of the ruby fabric. Many thanks to April Russell for her great idea and leadership! 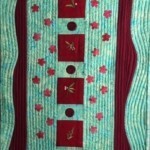 Follow this quilt at our Quilt Show and you will arrive at the Comfort Quilt Exhibit. 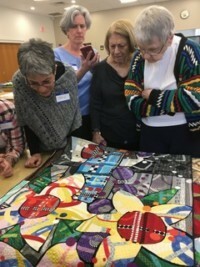 A wonderful sampling of the many beautiful and colorful Comfort Quilts will be on display. 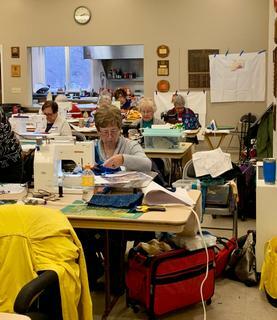 Thank you to all members who made quilts or donated fabric making it possible for NSQG to give comfort to those in need. Thanks to all who returned their raffle stubs and money to support this year’s charity Dulce Esperanza Camp. If you haven’t turned in your raffle money yet, you can still bring it to the April Guild Meeting. 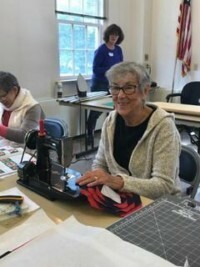 Drawing for the elegant charity quilt and the Bernina Sewing machine will take place at our May Guild meeting. 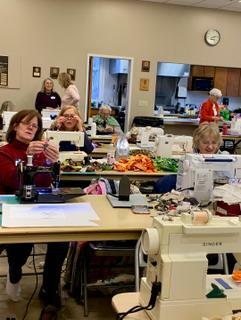 Please wear your name tag as there will be a drawing for a chance to win a Fat Quarter (don’t we all need more fabric). – Board meeting minutes are available for review at the library table.